Fine particles (PM 2.5), one of the major components of air pollution, are believed to be responsible for a large number of deaths in France and around the world. Those produced by diesel engines and by the combustion of wood in chimneys are often implicated. Gasoline engines emit ultrafine particles (less than 0.1), which are finer than those emitted by diesel engines and therefore difficult to take into account. Other important sources of fine particles, of different chemical nature, contribute to air pollution. 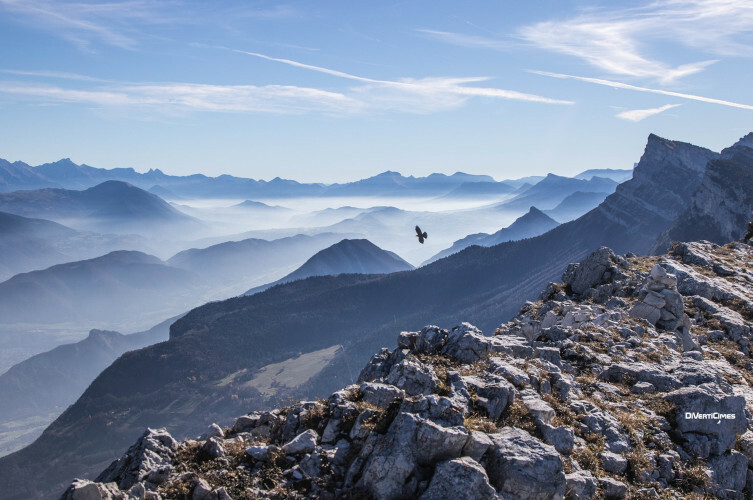 Monitoring networks provide the mass concentration of fine particles and these measurements are correlated with health data. Are they representative of the harmfulness of fine particles and more particularly those emitted by diesel engines or wood combustion? 1.1. What effects are feared? The nature, quantity and location of air pollution (Figure 1) have changed considerably, generally in the right direction, but their effects on health are still relevant and widely publicized. According to the World Health Organization (WHO) and the Institut de Veille Sanitaire (INVS) in France, fine particles (PM 2.5), one of the components of air pollution, are responsible for 7 million premature deaths worldwide each year, including 48,000 per year in France, or 9% of total mortality. It would be the third cause of death after tobacco (78,000) and alcohol (49,000), with the sum of these three causes accounting for about one-third of deaths in France. Worldwide, one in eight deaths is due to air pollution, while in France it is about one in ten. At 30 years of age, life expectancy would be reduced from 15 to 24 months. Although these very high figures are widely disseminated to the public by all media, they remain little visible in practice (we speak of an invisible killer). Morbidity due to air pollution is also observed in polluted sites, with fine particles always considered as responsible. The article “Air pollution” lists the main air pollutants, some of which may have a natural origin. While this pollution is periodically at the forefront of the news, its effects on health have not always been a major concern. During the 20th century, however, this atmospheric pollution was significantly reduced (see Figure 2). In the 1980s, the destruction of the ozone layer and the risks associated with climate change overshadowed health problems. At the “Grenelle de l’Environnement” in 2007, the introduction of a bonus-malus when buying a motor vehicle only took into account carbon dioxide (CO2) emissions and therefore the risks of climate change. 1.2. Where do they come from? This section presents the two main sources of particulate matter currently implicated, particularly in France, those from diesel engines in passenger cars, and to a lesser extent those emitted by the combustion of wood in chimneys. There are other major sources of fine particulate matter, less well publicized, that can have health effects. In mass concentration measurements, used to assess the effects of particulate matter on humans, there is no differentiation according to the origin or nature of the particles. They do not all come from combustion and therefore have different physico-chemical properties. Some are of natural origin such as pollens, spores and bacteria; they can also, even in low concentrations, have health effects. 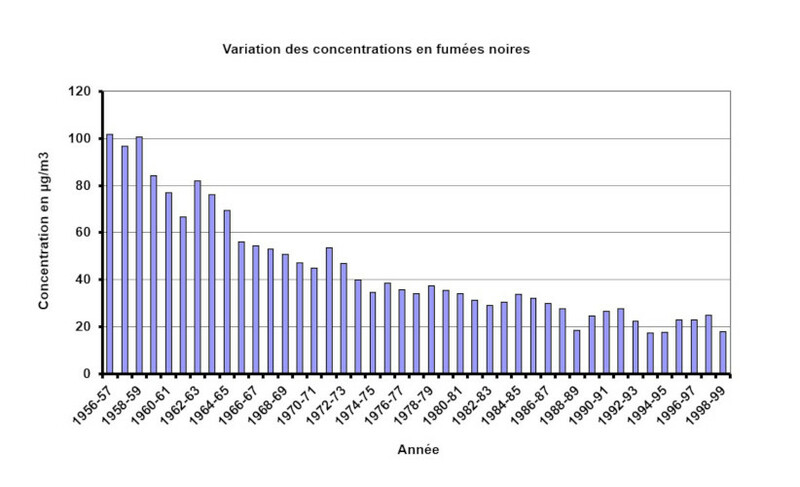 For example, we can note the respective importance of the various sources emitting PM 2.5 in metropolitan France, according to CITEPA  (Centre Interprofessionnel Technique d’Études de la Pollution Atmosphérique), and the evolution of these sources between 1990 and 2013 (see Figure 9 below). Pollution is also present in the air in workplaces and living quarters. In some parts of the world, wind erosion and biomass combustion cause the suspension of many particles and other pollutants with little studied health effects (see section 7 below). They are quantified by extrapolating the effects observed in areas polluted by human activities. These pollution levels, which can be high, are transported by atmospheric circulation over very long distances around the globe as shown in the video  in Figure 3, but also in Figures 5 and 7. Let us not forget the ultra-fine particles or nanoparticles emitted in particular by gasoline engines, whose number is very high, but the mass very low compared to that of fine particles (see Air pollution particles: what are they?). Although these particles are generally not considered in studies of the health effects of pollution, although they are often considered to be the most dangerous, they are present in airborne aerosols, associated with PM 2.5. The diesel engines that equip passenger cars and heavy goods vehicles, which are very numerous on the roads (Figure 4), but also construction machinery, agricultural machinery, locomotives and ships have been a major cause of air pollution for many years because of their emissions of particles, hydrocarbons, sulphur compounds and nitrogen oxides. One of the advantages of the diesel engine is its high energy efficiency. At the same power it consumes less fuel than gasoline engines and therefore emits less carbon dioxide. It is a self-igniting engine: the fuel (diesel fuel) is sprayed into the cylinder, the air is heated by compression, the diesel fuel ignites spontaneously without the need for spark plug ignition. Complete combustion would essentially produce carbon dioxide. However, the mixture is not homogeneous and combustion is not complete throughout the cylinder. The diesel droplets do not have time to evaporate and are only partially burned. There is therefore a formation of unburned particles, organic compounds (acetaldehyde, acrolein, benzene, formaldehyde, etc. ), PAHs (Polycyclic Aromatic Hydrocarbons), carbon, nitrogen oxides, carbon dioxide, materials whose displacement can be observed on the video in Figure 3. Injection at very high pressures, designed to better spray the fuel, improves combustion and reduces particulate emissions. Particulate filters at the exhaust level are now mandatory. Their effectiveness is rarely questioned. The regeneration of the filters is in principle automatic. The Paris City Hall, the French Ministry of Ecology, as well as other cities and governments, want to restrict the circulation of diesel passenger cars in the coming years. Car manufacturers are moving in the same direction, favouring electric or hybrid motors in their strategy for the future. The condemnation of diesel engines would lead to a faster renewal of old vehicles and the development of new types of engines. The bonus-malus introduced following the Grenelle Environment Round Table did not take into account pollutants other than carbon dioxide (CO2), which can have health effects, including fine particles. This bonus-malus, which favours diesel engines, continues to be applied, but the price of diesel fuel is increased to discourage the purchase of diesel cars. They are less implicated than diesel engines. In these engines, the explosion is initiated by an electric spark produced by a spark plug (spark ignition engines). The combustion is more homogeneous but there are also unburned and a much finer particle emission than in diesel engines. They are essentially ultrafine particles or nanoparticles with a size of less than 0.1 μm (see Air pollution particles: what are they?). Even if these nanoparticles are very numerous, the total mass is low. The new direct injection gasoline engines, with high pressure (100 bar) in the cylinders, allow fuel consumption savings. But, as in the case of diesel injection, there is an emission of nitrogen oxides and the formation of particles whose composition does not have to be very different from that of diesel engines but the size is smaller. In conventional engines these oxides are stopped by a catalytic converter. These new engines have pollution problems comparable to those of diesel. Particulate filters are not yet mandatory, but compliance with European regulations will make them essential. The emission standards concern the main pollutants emitted by passenger cars (diesel and gasoline). They are not limited to particles alone. Those defined at European level, called Euro, are regularly reviewed and made more and more stringent. They are expressed in mg/km (see Table 1 and article Outdoor Air Pollution: Understanding to Inform and Prevent). For diesel vehicles, from Euro 5 to Euro 6, the standard has been increased, for nitrogen oxides from 180 to 80 mg/km and for particulate matter from 5 to 4.5 mg/km. In 1992 with Euro 1 it was 140 mg/km. The last values cannot be reached without a filter. Due to the high temperatures in diesel or direct injection engines (1400°C), a larger quantity of nitrogen oxides NO and NO2 are formed, generally referred to as NOx. Diesel engines are thus considered as major sources of these pollutants. They actively participate in the chemistry and photochemistry of the atmosphere and give toxic secondary compounds. In particular, they are one of the components of the formation of highly oxidizing species such as ozone. For this reason, the emission standard for nitrogen oxides has been reduced by more than a factor of 2 with Euro 6 compared to Euro 5. It is 60 mg/km for gasoline engines. In 1992, NOx emissions were not regulated for any type of engine. Regulations have thus become more and more stringent, forcing manufacturers to make improvements in engine emissions. Table 1. 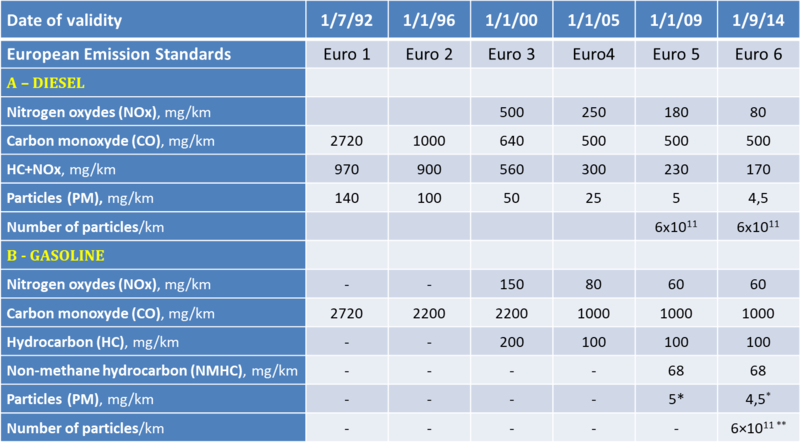 Evolution of Euro standards for diesel or gasoline vehicles from 1992 to 2014 in mg/km (except for particulate matter in number). *Only for direct injection gasoline cars operating in lean-burn (stratified combustion) mode. **Regulation 459/2012 allowed direct injection petrol cars to emit 6×1012 particles until 2017; they are now limited to 6×1011 as for diesel vehicles. To limit nitrogen oxide emissions, petrol engines are equipped with a catalytic converter that oxidises carbon monoxide and unburned hydrocarbons and reduces nitrogen oxides. However, to be effective, the engine must be warm enough, which limits its effectiveness for short trips. In diesel engines, the catalyst oxidizes carbon monoxide and hydrocarbons. The air-fuel mixture being poor, i.e. rich in air and oxygen, the pot does not reduce nitrogen oxides. An EGR (Exhaust Gas Recirculation) gas recirculation system reduces nitrogen oxide emissions in diesel engines by lowering the temperature of the exhaust gas, but not enough and must be accompanied by aftertreatment. There are currently two main ones. The selective catalytic reduction (SCR) system . Its principle consists in injecting an aqueous solution of urea or Adblue which is transformed into gaseous ammonia and transforms NO2 into nitrogen. An injection and storage system for Adblue is required and the Adblue reservoir must be filled with about 15 litres every 15 to 20,000 kilometres. With the second process or “nitrogen oxide trap” these are trapped in a catalytic converter using precious metals, the oxides are then regularly transformed into nitrogen. The NOx trap is less expensive than the SCR system but less efficient. These systems are sensitive to outdoor temperature and require adjustments that may vary with the approval conditions. The emissions, measured on the bench, are criticised and must be supplemented by measurements made under vehicle operating conditions. To take into account ultrafine particles, from Euro 5 onwards, a standard has been defined for the number of diesel engine particles, which must not exceed 6.1011 particles/km. For direct injection gasoline engines, this standard imposed a limit on the number of emissions to 6.1012 particles/km in September 2014, then to 6.1011 in 2017, as for Diesel engines. For carbon monoxide the standard is more stringent for diesel than for gasoline engines, respectively 500 and 1,000 mg/km. With Euro 6 the emission standards for diesel and petrol engines are comparable. Diesel engines equipped with particulate filters must in principle emit fewer fine and ultra-fine particles than gasoline engines. If manufacturers actually comply with these standards and do not try to circumvent them as some of them appear to have done  for nitrogen oxides, condemning diesel engines alone may no longer be justified for new cars complying with the standards. However, emissions may depend on the conditions of use of the vehicle, making it more difficult to control emissions. It should be stressed that pollution today is mainly produced by the oldest vehicles, in particular Diesel. However, the cost of pollution control condemns the smallest cars. Heavy goods vehicles, whether carrying goods or passengers, are equipped with diesel engines, but their contribution to pollution is rarely questioned by the media. They are subject to Euro standards which are expressed in g/kWh, which makes it difficult to compare heavy goods vehicles with passenger cars. The latest Euro 6 standard, in force since January 2014, sets the limit value for particulate emissions at 10 mg/kWh. NOx and particulate emissions have been reduced by 95% and 97% since 1993 (Euro 1). For the first time, the Euro 6 standard sets a maximum number of particles. These limit values make the particulate filter mandatory for new heavy goods vehicles. Pollution from heavy goods vehicles emitted in urban areas, near roads and highways, is also evident at the regional level, where it contributes to increasing overall pollution. Freight transport by rail should be the rule. The recent law promoting people’s bus travel contributes to the increase in pollutant emissions, which are in addition to the emissions of heavy goods vehicles transporting goods. This type of transport (goods and people) is not implicated in emission control measures during pollution episodes. Moreover, unlike railways, the fair price of road transport infrastructure is not reflected in the cost of road transport, as motorway maintenance charges are not paid by heavy goods vehicles in proportion to the road wear they produce. The “ecotax”, applicable to the non-highway network, which would have made it possible to partially finance road infrastructure, was passed by the French parliament and then abandoned despite equipment already built. 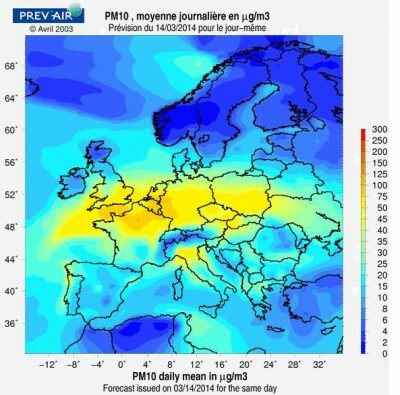 As shown in Figure 10, the high PM 10 concentrations provided by PREV’AIR  are observed for northern and central Europe for a large area that is not limited to urban areas. It is not enough to limit diesel car emissions in the centre of urban areas to have a good quality air. In the case of heavy goods vehicles (and other equipment such as boats, locomotives, etc. ), gasoline engines cannot replace diesel engines. It is often announced that, in the near future, these could be replaced by fuel cells, combined with electric motors. But this technology is not yet developed and it is not clear that it will be economically competitive with depolluted diesel engines. More recently, it is the open chimneys that are being challenged, particularly in the Île-de-France region, with a ban imposed by an order of the Paris Prefecture following the recommendation of the PPA (Plan de Protection de l’Atmosphère), followed by a cancellation of this authorisation following an intervention by the Minister for Ecology. Burning wood is a source of air pollution and in particular particulate matter, but it is also encouraged by tax benefits in the context of the forest-energy sector. Its use is not limited to the Île-de-France region, but it was publicized during this administrative episode. Wood combustion contains a large number of pollutants, including various organic compounds, PAHs, dioxins and particles, which correspond to incomplete combustion. Emissions depend on the nature of the wood (hardwood and softwood), the water vapour content (important factor which must be less than 15%), the type of fireplace, the combustion temperature, which can vary from 300 to 700°C. The efficiency of combustion, emissions are all the more important when the temperature is low. Open chimneys have a very low efficiency of about 10% and emit a large number of particles. Inserts, modern stoves, have yields of up to 70%. In Île-de-France there are reportedly 100,000 open fireplaces. The wood-energy sector has expressed its concern following the condemnation of the burning of wood. It encourages the use of wood, particularly for heating homes. On the other hand, ecologists protested against the abolition of the ban on wood in Paris. For representatives of the wood industry, the combustion of this material contributes only 5% to air pollution in the Île-de-France region; for the DRIEE (Direction Régionale de l’Industrie, de l’Environnement et de l’Énergie) this contribution amounts to 25% or 30%. By way of comparison, in Canada and the United States, standards have been defined to increase and regulate the efficiency of wood-burning fireplaces. The EPA (the American Environmental Agency) has defined a certification of fireplaces that has been adopted in Canada. In France, manufacturers of stoves and inserts have defined standards presented under the acronym “Flamme Verte“, with stars to characterize performance. Since 2015, the best performers have had 5 stars and this level allows them to obtain tax advantages from the administration during installation. The 5-star green flame label corresponds to a combustion efficiency of 70%, carbon monoxide (CO) emissions of less than 0.3%, particles less than 90 mg/Nm3 (30 times less than an open fireplace). New classes are in prospect with 6 or 7 stars. Figure 6. 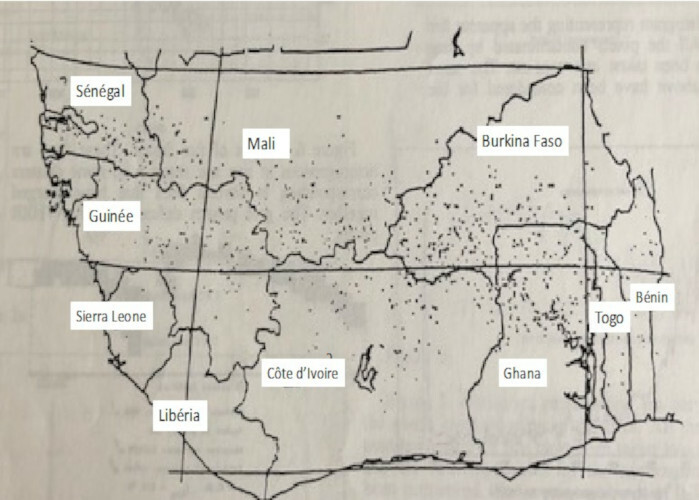 Vegetation fires in the Savannah regions of West Africa (each black dot represents one fire). Image obtained on December 12, 1986 with channels 3 and 4 of the NOAA-AVHRR observation satellite channels 3 and 4. Each fire is lit by man to burn the herbs. About 1 km long or more, it spreads by sparing trees. The particles and gases emitted during combustion are transported to the forest area to the south. This pollution is in addition to particulate matter from wind erosion in the northern area. To establish global PM mortality, other sources must be taken into account. 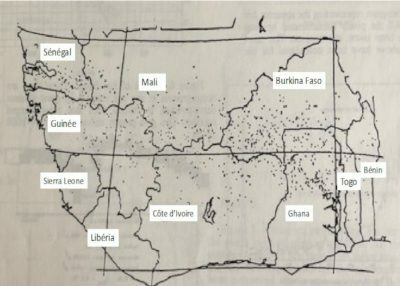 Thus, the atmosphere of intertropical regions in Africa, in the savannah region, is polluted by wildfires, most of which are lit by human hands (Figure 6, according to Brustet et al. ). Wood is also still widely used for food preparation. Fireplaces are sometimes in poorly ventilated rooms. This results in significant exposures to particulate matter and other pollutants. Emissions from biomass combustion are transported from the savannah regions of the northern and southern hemispheres during their respective dry seasons to the equatorial forest where secondary compounds such as ozone are found at levels comparable to those observed in industrialized countries. This pollution is in addition to that produced by wind erosion, which leads to very high particle concentrations, a few hundred µg/m3, which are transported over long distances by atmospheric circulation and the finest particles, several thousand kilometres (see Figure 3). Erosion is all the more intense when the soil is dry and the vegetation rare. These particles have dimensions ranging from 0.1 to 100 µm. This phenomenon of wind erosion is not specific to Africa. It occurs in all arid or semi-arid regions, for example in the Mediterranean regions. These particles are added to anthropogenic production, but their nature is very different and they do not have the same toxicity. The global extension of the health and mortality effects of particulate matter, particularly from satellite measurements, does not take into account their different properties from those of anthropogenic particles. However, the highest concentrations of fine particulate matter (PM 2.5) are found in intertropical regions (Figure 7). Their health effects are in addition to those due to very high temperatures in the dry season (over 40°C). The ACASIS (acronym for Alerte aux Canicules Au Sahel et à leurs Impacts sur la Santé, or Sahelian heat waves and their impacts warning) research program aims to predict heatwaves and define their health effects. It should be noted that high temperatures generally correspond to high concentrations of particulate matter, which should lead to synergy effects. Other sources of particulate matter are numerous. In road transport, to the particles resulting from the combustion of fuels, we must add the particles emitted with the wear and tear of tires, brakes and road surfaces. From the beginning of the 20th century, industrial activities and energy production with coal-fired and then oil-fired power plants were major emitters of pollutants, including particles of a very diverse chemical nature, some very toxic. Figure 8. 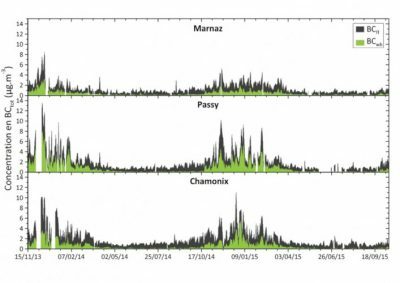 In the Arve Valley, between 2013 and 2015, changes in soot carbon concentrations from the combustion of firewood (in green, BCwood burning) and fossil fuels (in black, BCfossil fuel) from the three DECOMBIO programme sites. Source: Reproduced with permission of the authors, see ref. . Particles may be emitted directly into the atmosphere or may result from chemical or photochemical reactions in the gas phase or in mists or mists. In the 1970s, an important manifestation was the acidification of precipitation that led to forest dieback in some areas of Europe and the United States. This type of pollution, called “transboundary pollution”, has now been controlled. Industrial sources, in particular, have now declined significantly due to plant closures, effluent treatment, etc. To characterize the unburnt particles in the particles, we measure the carbon or soot carbon content, or even Black Carbon (see Figure 8). Particulate matter from biomass combustion can be distinguished from that emitted from fossil fuel combustion . This measure remains ad hoc and is not generalized in monitoring networks. It is not used to differentiate the toxicity of different particles and their health effects in the aerosol. Agriculture is also a major source of particulate matter from various sources. Polluted areas are not limited to urban areas, as shown in Figures 6 and 9. 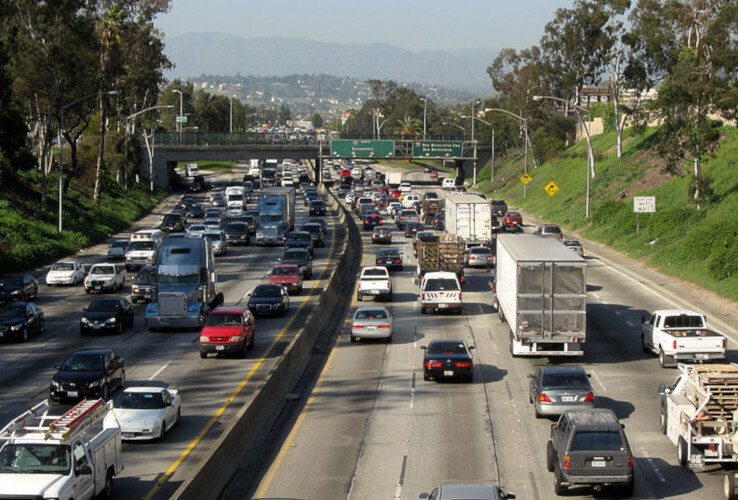 Automobile emissions in urban areas are not the only cause of air quality degradation. The emissions inventory published by CITEPA confirms the diversity of sources (Figure 9). For PM 2.5, road transport accounts for 18% of emissions, agriculture for 9% and wood energy combustion for around 45%. AIRPARIF (the body in charge of monitoring air pollution in the Île-de-France region) carries out emission inventories for the Île-de-France region. The published results are in the same direction with a reduction in emissions for road traffic and wood heating. In a polluted environment, when in the vicinity of sources, pollutant concentrations can be very inhomogeneous. Exposure doses, which characterize the quantities inhaled, are then difficult to estimate. An example, among many others, illustrates this phenomenon. 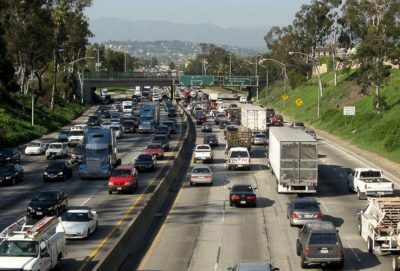 Several organizations have compared the dose of exposure to pollutants from a pedestrian, cyclist or motorist. The strongest is generally that of the motorist. This is not surprising. Indeed, during a traffic jam, the cars come to be placed under the exhaust pipe of the car in front, bumpers against bumpers. The pollutants emitted by the car in front of you enter the cabin largely. A distance of a few meters allows a dilution of pollutants and therefore to limit pollution in cars. A simple recommendation would be to advise motorists to leave an interval with the car in front (see Figure 10). The installation of particulate filters for air entering the passenger compartment, which are more efficient than those of air conditioning systems, would remove a large proportion of the particles, improve air quality and reduce exposure doses. They are not measured as ultrafine particles in air pollution monitoring networks, which does not mean that they are not present and have no health effects. They are collected with fine particles and are confused with them because of their low mass. Their concentration must be measured in number per unit volume. Their penetration and deposition in the respiratory tract are analyzed in the article on the properties of particles (see Air pollution particles: what are they?). Figure 11. 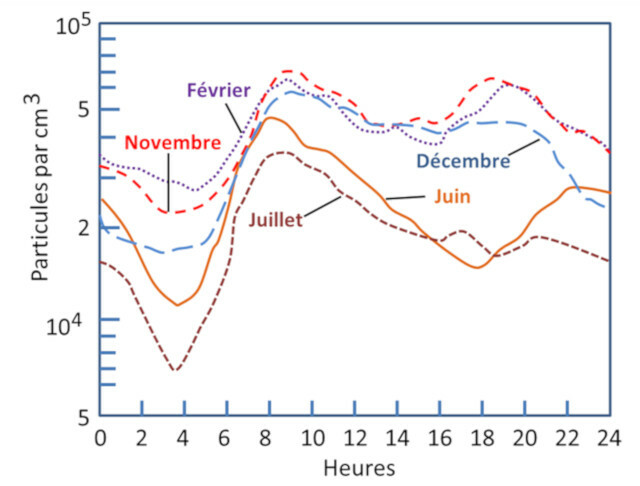 Average daytime variations in concentrations (by number) of ultrafine particles in the city of Toulouse for different months of the year. There are many sources of ultrafine particles. They are formed in particular during combustion but also result from reactions in the atmosphere between gases such as sulphur dioxide, nitrogen oxides and hydrocarbons, most often under the action of solar radiation. They are composed of sulphates, nitrates, carbon compounds. They can result from the condensation of metal vapours from industrial effluents. They can be of natural origin following, for example, the emission, by vegetation, of organic compounds such as terpenes, isoprene. With solar radiation they have a bluish appearance due to their small size which preferentially diffuses the short wavelengths of solar radiation (Rayleigh scattering, see Air pollution particles: what is it all about? and The colours of the sky). We sometimes talk about blue haze. These particles, resulting from the decomposition of plant species, are sometimes considered beneficial to health. They are or have been promoted in cities that were once classified as bioclimatic, such as Arcachon . As with fine particles, concentrations of ultrafine particles are higher in the winter months, with the same type of diurnal variation for all months of the year: a minimum in late night, maxima in early morning and late day. Figure 11 shows the large number of particles between 104 and 105 particles per cm3, which is typical of an urban area. Fine particles represent only a small fraction of the number of these particles (a few tens per cm3) . The midday decrease corresponds to the development of instability in the lower layers of the atmosphere, which is greater in summer than in winter. This diurnal variation is typical of local sources. (It is less pronounced for particulate matter, than for example for nitrogen oxides, showing a greater local contribution for nitrogen oxides in urban areas). Photochemistry is very active in summer with solar radiation. The composition of the air is not the same in summer and winter. Among the many pollutants of photochemical origin forming in the atmosphere is ozone, whose toxicity and oxidative power are well known. The very numerous ultrafine particles will coagulate with each other or attach to larger particles, thus limiting the life span of the finer ones; this coagulation does not affect the mass concentration, but only the properties of the particles. We have seen that cars with diesel engines are not the only ones responsible for particle pollution. 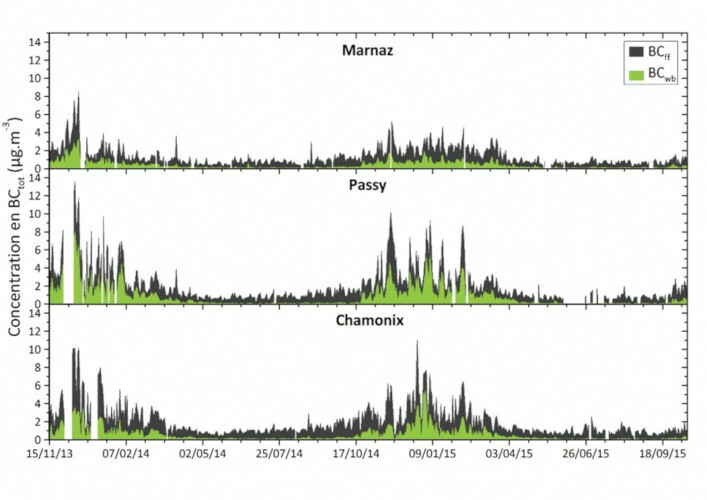 The mass concentration that is measured in monitoring networks (or by satellite or with models) does not take into account the nature and toxicity of particulate matter. These can absorb water vapour, especially if they are soluble particles. Depending on the hygrometric degree, this results in variations in their mass and size during sampling. Air pollution, particularly in polluted urban areas, is a complex mixture of pollutants, including ultrafine particles, which have synergistic effects. It is therefore difficult to quantify everyone’s responsibility, particularly that of fine and ultrafine particles. Concentrations are very inhomogeneous, which complicates the determination of exposure doses and the implementation of sensors in pollutant measurement networks. The composition of the pollutant mixture varies with solar radiation, which leads to photochemical reactions and new and often more toxic pollutants. The physical and chemical characteristics of the particles are modified. Meteorology affects health and well-being. This is the field of biometeorology. Temperature is the parameter whose effects, particularly on mortality, are best known. They depend on the climate and people’s lifestyles. They must be distinguished from the effects of particles or pollutants whose concentration variations are related to temperature variations. Living particles such as bacteria, viruses, spores, pollens are sensitive to weather conditions and can have health effects. Air pollution levels have decreased significantly since air quality monitoring began in the 1950s, particularly for particulate matter as shown in Figure 2. Diesel engines were fewer in number but they were very polluting. The consequences on health effects are not quantified, except for episodes of very high pollution, such as those in the Meuse Valley or London. The identification of a very significant improvement in health (which can be assumed) would be an argument that would allow the public to better understand the issues involved in improving air quality. The harmfulness of particles emitted by diesel engines in cars is not debatable, but there are many other machines, including trucks, that run on diesel engines. Newer cars are equipped with emission control systems that severely limit their emissions of particulate matter and nitrogen oxides. There are many other sources of particulate matter causing high concentrations of particulate matter in the atmosphere, some of which are of natural origin. Some of them are likely to produce allergies. The main sectors responsible for the production of fine particulate matter (PM 2.5) are the combustion of wood to heat homes, agriculture with the use of fertilizers, manufacturing industries and transport. Ultrafine particles are collected with fine particles from which they are not separated due to their low mass. Their number is very high. The Euro emission standards for engines, defined at European Union level, cover both fine particulate matter and nitrogen oxides. For both diesel and gasoline vehicles, the Euro 6 standard for particulate matter is 4.5 mg/km. This value cannot be reached without the addition of filters. The complexity of the phenomena with regard to air pollution and its effects requires a completely multidisciplinary approach with doctors, epidemiologists, physicists, chemists, meteorologists, etc. Cover image. Emissions from diesel cars and wood-burning fireplaces, considered to be very harmful to health, are regularly charged. But other important sources exist, in particular heavy truck traffic, as well as, in some regions, wind erosion and biomass combustion [Source: editing from royalty-free images]. The manufacturer Volkswagen had developed software that disabled the NOx emission control system when the test was completed, resulting in emissions well above the standards. To cite this article:	FONTAN Jacques	(2019), Diesel engines and wood combustion in charge, Encyclopedia of the Environment, [online ISSN 2555-0950] url : https://www.encyclopedie-environnement.org/en/air-en/diesel-engines-and-wood-combustion-in-charge/. Air pollution particles: what are they?